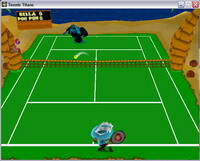 Using a familiar break-out mouse control, you play with seven colorful 3D characters in either Classic Tennis or Rings Mode. Simple to learn, easy to Love. Hit the courts for some rowdy tennis fun with seven flavorful tennis characters! Featuring simple, easy-to-learn hitting and aiming, Mac Tennis Titans brings together a crazy crew of colorful cartoon characters who all want the same thing - to be Court Champion. Plus, two great game modes means there's more ways to win! Charming, delightful, and beautifully rendered, Tennis Titans for Mac is a challenging treat for the entire family.